I mentioned to Lisa about my only time in Conroe which was the summer of 1970 before I started college in the fall. I was in Houston visiting my dad and while he was at work, I would drive around and explore Houston with my then boyfriend, Jim. Jim and I decided to take a day trip to the beach at Galveston. As we were returning to Houston, we realized that we were hopelessly lost in that spaghetti bowl of a highway system that is Houston. I have no idea what it is like today, but in 1970, just out of high school and neither of us with a sense of direction, it was a nightmare to drive, plus billboards everywhere got us distracted. Why did Houston have so many billboards? Somehow we ended up in Conroe, outside of Houston after being lost for hours and hours. I’m so glad now that I have put aside those memories and now think of Conroe as “Lisa from Conroe,” my new friend. 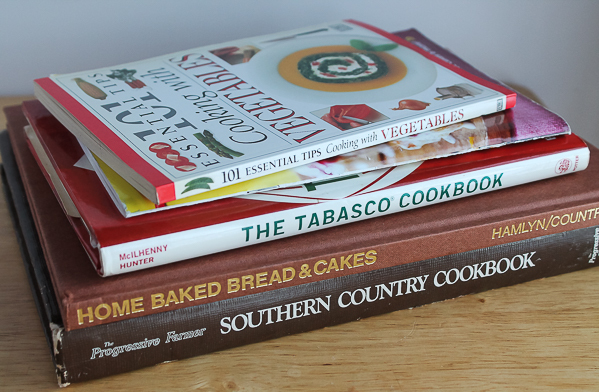 Lisa sent a box of cookbooks of ones she thought I would like after reading some of my blogs, like a Southern book as my youngest daughter now lives in the South. Or these two groups of books mostly from regional communities, associations, and places of business. Or one of my favorites, church cookbooks! 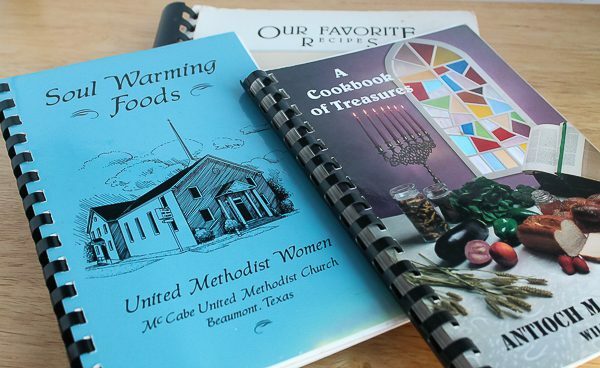 I love church cookbooks especially from small towns as I believe those who offer their recipes are tried and true family favorites or recipes passed down from great-grandmothers. 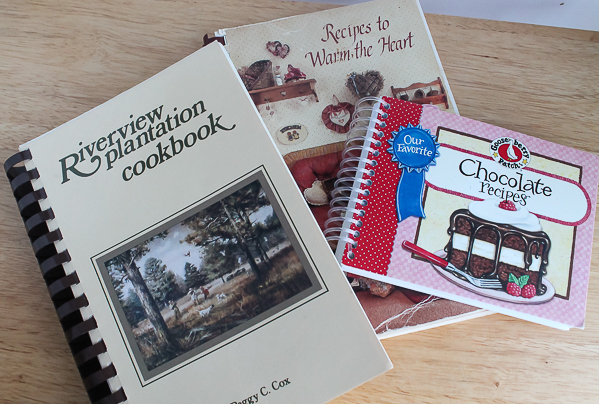 Some of my favorite recipes have come from old church cookbooks. I decided to try a recipe from the blue book, “Soul Warming Foods,” because I am Methodist and there was a recipe with a funny name that I wanted to try. Many times I will choose recipes with strange or funny names because I want to see if I can figure out why it has such a name. The funny name here was “Charleston Mud Hens.” What is a Mud Hen? I had no idea and had to google to see what I could find. I found that there actually is a hen called a Mud Hen, but it is also the name of a minor baseball team in Toledo, Ohio! So where did Charleston fit in and why would a baseball team select Mud Hens as a mascot? 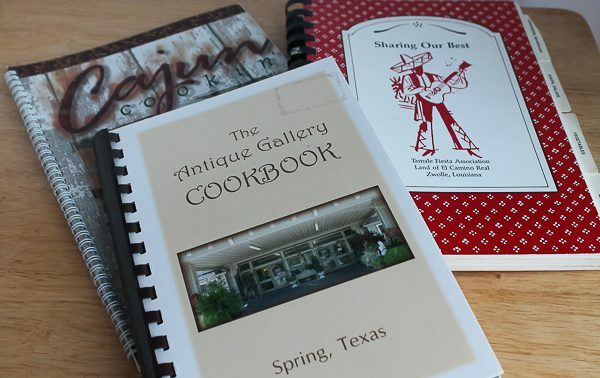 And the cookbook is from Beaumont, Texas. Maybe someone knows the answer and can tell me. But here is the photo of the Charlotte Mud Hens recipe. 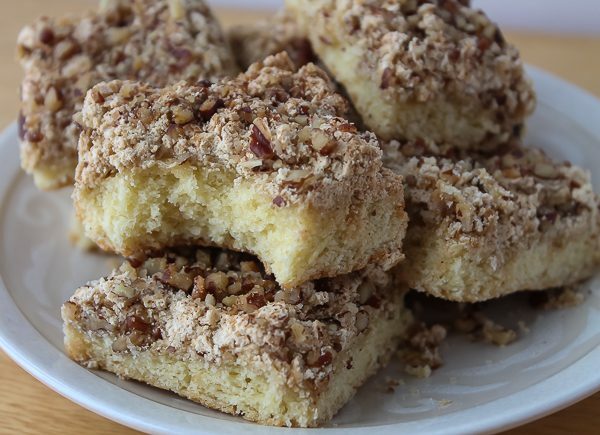 These were described in the cookbook as “Meringue-topped, pecan-studded cookies with a charming name.” It all sounds correct except I found it more like a coffee cake consistency than a cookie, and definitely interesting with the addition of bourbon. I like recipes with dash of something a little different and unexpected. Thank you, Lisa from Conroe, from Debbie from Libertyville. I’m so glad we found each other, my friend! Heat oven to 375 degrees. Lightly grease and flour a baking pan, about 11-by-10-inches. (I couldn't find that size but had one close enough). Combine flour, baking powder, and salt; set aside. In bowl of electric mixer, cream together butter and granulated sugar until light and fluffy. Separate 2 of the eggs. Add yolks one at a time, then 1 whole egg, beating well. Stir in bourbon and vanilla. Beat in dry ingredients until mixed, then spread mixture in prepared pan. Beat the 2 egg whites until frothy. Add brown sugar and beat until stiff peaks form. Spread over dough in pan. 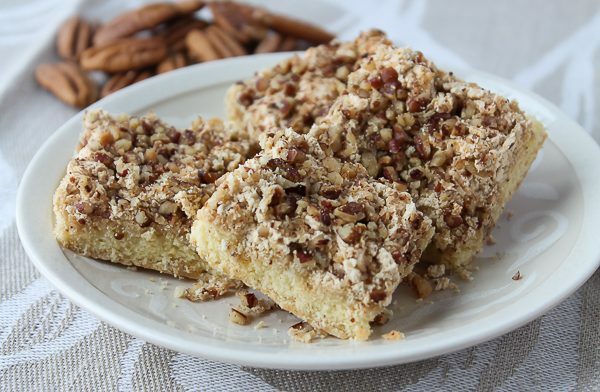 Sprinkle with nuts. Bake for 20 minutes. Cool, then cut into bars. Imagine my surprise when I looked at my emails this morning and saw “Lisa From Conroe”!!! What a sweet thing to do!!!! I have some more books to send you sweet friend!!! I was happy to finally see a photo of Mud Hens, I had seen the recipe for years, but never a photo. Glad you decided on that recipe! Debbie, you are a dear, I am so glad we met!!!!!! You are a blessing, I so enjoy reading every post you print. They warm my heart!!!!!! Lisa, it was a pleasure to write this blog! I am so happy we connected, and I cherish you being not only a new-found friend but one of my most loyal readers. Thank you for both. You warm my heart too. This is all so fabulous…new friends after losses, church cookbooks (Methodist, no less! ), and bourbon! Today is a great day for baking! Every day is a great day for baking! Thanks for writing, CleoDee! Debbie, you made my day!! Guess what?!!! I’m going to be a grandma again!!!!! My grandsons mama, my youngest daughter, is having another baby!!!! Elliette is going to be a big brother!!! My heart is so full!! I saw your granddaughters photo on facebook. She is so beautiful, just like her mama! I know you are a proud grandma, just like me!!! Thank you for making my day and warming my heart!! Lisa- I am so happy for you! How exciting to be a grandma again! Best wishes and blessings to you and your family. Keep me posted! Lucky baby to have you for a grandma. A delightful story from a longtime friendship. So much kindness and encouragement has blessed your home after your tragic flood and loss. Warms the heart.